The CBC Keeping Anti-Americanism Alive One Broadcast At A Time. A Liberal senator (what other kind is there?) has replied to a family in Minnesota upset about Canada's seal hunt with a letter denouncing the United States for executing prisoners at home and killing people in Iraq. Senator (for life) Celine Hervieux-Payette says Americans are in no position to criticize the Canadian seal hunt. The McLellan family had written to Canadian senators to say they cancelled a vacation in Canada because of the hunt, which they called "horrible" and "inhumane," Montreal's La Presse reports. 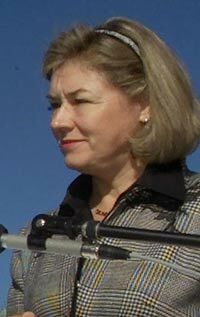 In her response, Senator Céline Hervieux-Payette said that what she finds horrible is "the daily massacre of innocent people in Iraq, the execution of prisoners – mainly blacks – in American prisons, the massive sale of handguns to Americans, the destabilization of the entire world by the American government's aggressive foreign policy, etc." She said Americans are not in a position to criticize others. "They must start to look at their own behaviour, the permanent heightening of the planet's insecurity since the election of Bush," she told La Presse. The family "did not choose a good cause," she added. In their letter, the McLellans said they love Canada and have Canadian ancestors but cancelled a trip to Canada last year because of the seal hunt and will scrap plans for one this year if the spring hunt goes ahead, La Presse said. Hervieux-Payette, a lawyer and former Liberal MP, was appointed to the Senate in 1995 by then prime minister Jean Chrétien (Boo, hiss). She last drew public attention with a private member's bill in 2004 to outlaw spanking of children. In defending the seal hunt, she called it a centuries-old practice and part of the livelihood of coastal residents both native and white. It is not clear whether she might pay a penalty for remarks that could be seen as anti-American. Once appointed, senators have a job until retirement at 75. We're going to need more wooden stakes.